How does a creative approach to a local environmental study affect Y3 children’s attitudes to learning? Our project was a creative process of designing a Willow Sculpture to improve our school environment where ALL children were involved in the design and making process and SOME children were involved in the final stages of design and making. Year 3 children who have a low self-esteem then became a focus group for some of the detailed work on the sculpture. The rest is yet to come!!! To create an outside sculpture to improve our outdoor environment. To involve children in the design and making process of a large outdoor sculpture. To challenge thinking about what is possible. Main findings: children with low self-esteem really flourished in their confidence levels. They became involved during the making process which made them feel safe, then they were challenged in their thought processes in order to continue this development. Just over 5 years ago, when I joined our school as an NQT, we had an OFSTED. The outcome was ‘Special Measures’. We got a new head and began developing our school. We spent 2 years working extremely hard to improve out ‘Teaching and Learning’ and managed to get out of Special measures in a short amount of time. Since then we have been continuing work on ‘Teaching and Learning’ and have since begun thinking about the implementation of a Creative Curriculum. In July 2007, I began an overhaul of the Curriculum at our school and now the staff have begun to take on this responsibility for themselves, planning work that makes valid links between learning experiences. We wanted to get involved with the CARIS project originally because we thought that working alongside professionals would be a good thing for the children. We anticipated that this would allow us to develop the ‘Arts’ in our school. As we got more and more involved in the project, however, we realised that there were so many opportunities for us to grasp and help the children become a part of. On the day at the City Hall, my colleague and I went along quite naively expecting to walk away making a link with someone who would make us ‘something nice’ for our outside environment. We saw the Circus entertainers and the Media Man, the Lady Sculptress and lots of wowing products. When we happened upon Steve and Simone we were definitely beginning to jump straight into our own creative process and found ourselves planning a product. Little did we know then just how our project would develop! Getting ourselves out of the ‘Product Zone’ was quite difficult to begin with but we soon realised, after the Partnership days at Bannerdale, that we would need to take a step back and focus more on the Creative side of this project, with an emphasis on the children. Our original question was vague and had lots of holes: ‘How does a more creative approach to the Curriculum impact on the children’s’ attainment as a whole?’ We took some very useful feedback and, after thinking again about what our school was working towards at the time, we decided to focus on lower attainers within school, what their attitudes to learning were and how this could be changed by using a more creative approach to teaching the curriculum. Our question became: How does a creative approach to a local environmental study affect Y3 children’s attitudes to learning? We had some very strong ideas of how we wanted our project to go and tried to plan for lots of learning experiences. What we found was that the actual project seemed to have a life of its’ own and that, even now, there are plenty more learning opportunities to experience. The children involved themselves at all levels, including the creative and physical aspects of designing and making the ‘Birley Dragon’. They were enthusiastic and seemed to thoroughly enjoy the making process. The staffroom was a very interesting place to be in the fortnight the artists were in school. Many members of staff did not associate with the artists which shocked me as we’re normally such a friendly bunch of people! Because the project involved the whole school (3-form entry, 570 pupils) the organisation of who was going where at what time was difficult to manage. Thankfully Andy sorted most of this out! What began as a quite stressful week soon got exciting! Here is an extract from my diary on the first day of the project. So it’s Monday 19th November 2007, a wet, grizzly day. The artists arrived early – gave them a cup of tea, all is well… for now! Then some students arrive to be welcomed and Steve and Simone have finished said cup of tea. Off I went, chatting to the students for 15 minutes before going back to chat to the artists who have now amalgamated all the designs into one big amazing thing! Dear me, better get the children then. The children were collected from all around school and come back for a chat with the artists who told them that all their designs were great and we would be taking ideas from everyone to make up the final animal/creature. The children seemed very happy this morning to find that all their hard work wasn’t for nothing and we had a resounding ‘Yeah, ‘that’s fair!’ coming from most of them. So that’s what we decided to do. All the children are going to be involved in some way, big or small. What was really good about this first day was that, although we had initially tried to give the project a strict focus by finding a specific design, Steve and Simone used their creativity to amalgamate most of the designs we had and instead of creating a ‘Hamster(! )’, creating a Birley Dragon! Grrrrrrrrr! Where it all began: The central stick! Of course, the making of our dragon fulfilled our Creative Curriculum needs in many ways. The children were involved in digging, planting, shaping and stretching the willow. They used digital cameras to record one another’s work. They were able to ask lots of questions about how willow grows, the types of willow used and they found out lots that Steve and Simone told them. For example: there are many types of willow; willow needs to be soaked before we can bend it; willow can live again once it has been cut. What I was very aware of during this stage of the project was how practical we were being and I was worried we weren’t being ‘creative’ enough! The first session at Bannerdale had taken place and my own definition of the word ‘creative’ had been challenged. I really struggled to accept that there needed to be boundaries when being creative. To me, this was a contradiction in terms. Through being involved in this project I have begun to accept that we need to have boundaries when presenting children with creative projects because, without these, projects could go off on tangents and take turns that lead us nowhere! On the other hand, being too restrictive with the boundaries can hinder creative thinking. The lower attaining children we highlighted through the PASS survey (Pupil’s Attitudes to School and Self) were children who can easily be inhibited by boundaries. Working in partnership was a wonderful experience. Steve and Simone were friendly and the children commented on their helpfulness afterwards. They were able to challenge the children’s thinking, pushing them to think ‘outside of the box’ sometimes. What I would do different next time is that I would have had more time to work alongside them on the sculpture. Whilst I was able to get outside and support them some of the time, there were other times where, being a class teacher, I was back in the classroom and therefore unable to work as closely as I would have liked. However, this gave other teachers the opportunity to make links with the artists and work alongside them too which seemed to improve relationships a little, although I know the artists still felt a little segregated. I would certainly like to think that if we got involved in another partnership I would do things a little differently. I would certainly make sure more members of staff were involved in some of the first stages. I feel that if more members of staff were involved at the beginning, they would have been more likely to have gotten further involved in the later stages. Action research allows practitioners to take an outside view of learning taking place. As a teacher I am always embedded at the centre of the children’s learning and often find that I cannot observe without interruptions. Working with our partners enabled me to take a back seat and watch the activities folding out in front of me. I was the observing rather than the facilitator and I loved this aspect of the project. We could eat out lunch there. We could do art in it. We could hide in it. We could write stories about a wicked dragon. We could measure the dragon. We could see if anything lives in it. We could cut bits off and make things. We could shelter there from the sun. I feel that the ‘Dragon’/ the ‘product’, which was the climax to the project from the outset, is now the catalyst for the creative teaching/learning we can now expect to happen. In the Summer we are preparing a staff meeting that will allow me to work alongside staff to develop the use of the ‘Birley Dragon’! I hope this will give staff opportunities to talk about how we might use it in a range of lessons. My own Year group will be looking at the dragon as a perspective correspondent next term. In Literacy we are going to be learning how to write letters and we will begin by ‘receiving a letter from the Birley Dragon’. Hopefully this will spark some imaginary friendship letters from the children to the dragon and so forth. I imagine the ‘dragon’ will come to life at night and leave his letter pinned to the ground and the children will find this fascinating. We also aim to improve the area around the dragon by planting bulbs etc. This will be done very shortly and, hopefully, the children will see the outcomes before they break for summer. On the final CPD day, Steve and Simone and myself, along with Jill Jesson (who has been a real help) came up with some other great ideas for further creative work on the dragon. These include: our school Newspaper Gang writing an article about the dragon, Reception children to visit the dragon with the ‘wands’ made out of spare bits of buff willow to make magic spells, create a Dragon Club in Y5 who will hopefully maintain it, have a treasure hunt and plan some exciting writing opportunities as well as art opportunities. The one thing I know we must have in school is a wormery! How much do our children love worms? LOTS!!! We used the PASS survey to find out which children in Year 3 have a low self-esteem. We felt that these children were under-achieving in Literacy mainly and we originally hoped to inspire them in their writing. Therefore we levelled some writing before the project and after the project and found that 2 children had progressed by 2 sub-levels whilst the other 4 progressed by 1. This part of the project, whilst being very successful was only the beginning of the success it created as a whole. At first finding things to ‘measure’ seemed daunting and, with hindsight possibly a little unnecessary with regards to the creative process but it did allow us to have a focus. The project is only the very beginning of what we want to do at our school. 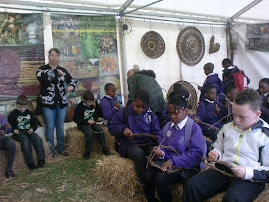 The next steps for us involve using the willow sculpture to creatively teach a given part of our curriculum. The design process in the beginning was very successful. We would like to continue using this process when thinking ‘what next for the Birley dragon?’ My aim is to engage children in a process of deciding the next steps. I will ask School Council to ask their classes in turn what they would like to use the dragon for now, and then write some ideas down for discussion with staff in the Summer term. There are many implications for my own practice as well as the practice of my fellow colleagues. The biggest and most prominent of these is the development of the Creative Curriculum as a whole school initiative. Whilst we have begun work on this, it needs further development if it is to be successful. Next term we have already planned to do some focussed work on delivering relevant, interesting, enjoyable learning experiences to all children in our school.